Parades & King Cake & Beads & Weather, Oh My! I can’t believe another Mardi Gras season has come and gone!!! This one was fantabulous!!! I’m a late comer to Mardi Gras and I had never attended a Mardi Gras parade prior to moving to NOLA. I celebrated Antigua’s Carnival and j’ouvert morning as a Peace Corps Volunteer, but that 10-day festival celebrates England’s emancipation of slaves (August 1, 1834) rather than the Catholic calendar. I had gone to dinners on Fat Tuesday that included Mardi Gras/New Orleans themes complete with beans and rice, king cake and jambalaya, but again, that’s not Mardi Gras. I held many of the assumptions that many hold that Mardi Gras, New Orleans style, is all about women flashing their ta-tas for beads on Bourbon Street. Was I in for a surprise then in 2010 when I was immersed in my first Mardi Gras season!! For one thing, locals, transplants and anyone who has been in New Orleans during Carnival season do not spend much time around Bourbon Street, if at all. The French Quarter, Frenchman’s Street and Royal Street are the locations for Krewe du Vieux two weekends before Mardi Gras, the Krewe of Barkus one weekend before, and St. Ann’s Parade on Mardi Gras Tuesday, but seriously, Bourbon Street is avoided. In the 1970s, floats got so big that unless it is a walking parade (which the 3 parades above all are), the parades can not go through the Quarter! Instead, most Orleans parades either extend along the Uptown, Canal/Mid-City or West Bank routes. And yes, there are Mardi Gras celebrations and parades outside of New Orleans, from Lafayette to Biloxi to our own suburb, Metarie, but why go there when there is so much going on here?!?!? About the beads…sure, showing a little cleavage might get you a few extra beads, but so does being tall, attractive, a kid on a specially made parade ladder or watching a parade in an area that isn’t very ‘deep’ with people! Yes, grabbing ‘throws’–beads, cups, doubloons (coins specific to a krewe), toys and other kitsch is a big deal, it’s just not all about the ta-tas. My next parade is my favorite, the Krewe of Nyx parade. Nyx is an all-woman krewe that rolled for the first time in 2012. I considered joining, but got caught up in the whole BC thing and didn’t follow through, but have loved watching the parade and trying to catch their signature throw, a decorated purse. The cool thing is that this year, the Louisiana Peace Corps Association was invited to march in the Nyx parade–and I did follow through on this one! We marched on Wednesday, February 26 in the evening. We followed the 28th float and there were 46 of us out representing Peace Corps–and it so happened that it was Peace Corps week, which added to the magic. The evening was chilly and threatening rain, but we represented with country of service flags and dress, hiking boots and Teva sandals, and PC stickers as our ‘throws’. Since we were at the back of the parade, we staged at a spot that allowed us to see the parade go by which meant that not only was I in my favorite parade, but I got to watch it as well! 🙂 It was truly a unique and wonderful experience to get a glimpse of Mardi Gras from the ‘other side’. The energy of the crowds was awesome and since we were marching, we didn’t have to wear masks which meant friends & hubby were able to find me and say ‘Hi!’. It was so cool to give out stickers and wave and cheer! Such positivity!!! I even had one guy from St. Kitts, who was marching with another group, come up to me and ask what the story was with the Antiguan flag I was carrying, before the parade started. 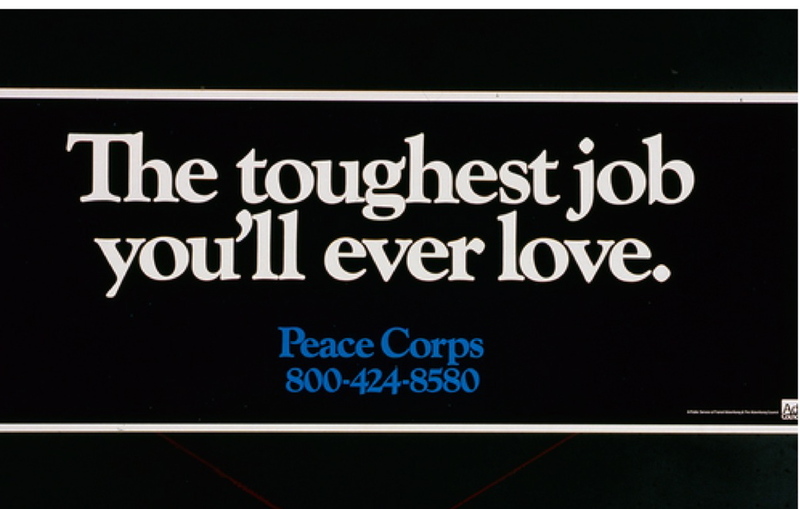 We had a really nice conversation about the islands and Peace Corps. Special memories. Needless to say, I was one tired girl at work on Thursday. Luckily we got out at 2 so everyone could get home before the streetcars stopped running for Thursday night’s parade, Krewe of Muses. Can we say nap time? Terry and I went to the Muses parade Thursday evening, but stayed in Friday evening to regroup–and clean the house since my parents were on their way to experience their first Mardi Gras! 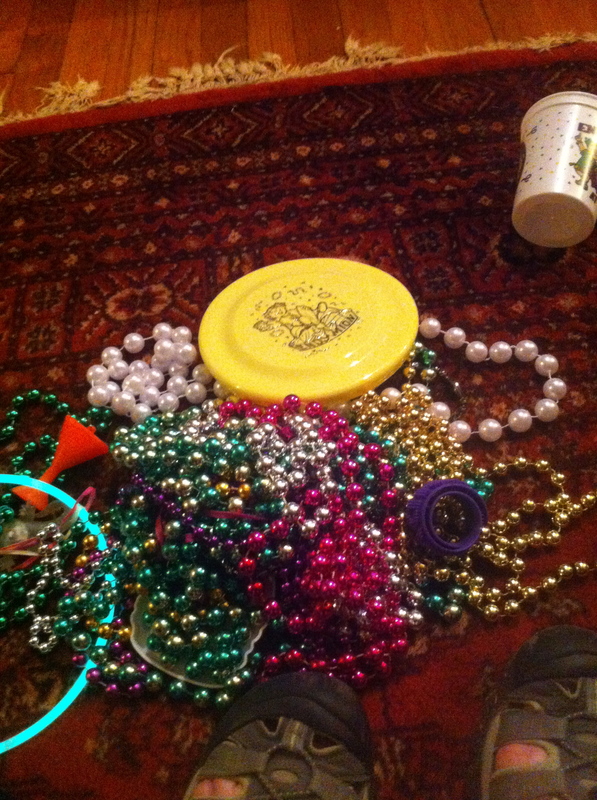 My parents arrived on Saturday in time to go to the late afternoon parade of Endymion. This is the only parade that rolls through mid-city anymore (the Mid-City parade actually rolls along the Uptown route these days) and it is a big deal. People were staking their area and setting up chairs and picnic shelters on Friday! My parents brought their bikes so we were able to bike over which definitely added to the adventure! On Sunday, March 2, we were back on the Uptown parade route at the Krewe of Thoth parade. It was a very warm day and the parade route was crowded, so my high points were a crawfish boil we attended after the parade and riding our bikes home–while everyone else was stuck in traffic! We stayed in Sunday night instead of going to the Bacchus parade. Naps and Academy Awards won out, but we were back at it Monday night for a barbeque and Harry Connick, Jrs parade, Orpheus. The weather was at least 35 degrees colder than Sunday and windy and we didn’t see Harry this year (taping American Idol? ), but the crowds were light, the barbeque was yummy, I caught beads thrown to me by our mayor, and we caught a lot of throws. It was a good night! So, another thing to keep in mind is that the majority of schools in Orleans are off the week of Lundi (Monday) and Mardi Gras days, most businesses are closed or have abbreviated hours on Mardi Gras day and many businesses get out early on Lundi Gras as well. This is a big deal for everyone. For those who don’t like parades and crowds, they generally leave town during this time (my surgeon heads out west skiing and many head to Orlando). However, instead of sleeping in on Mardi Gras, on Tuesday morning itself, everyone is up early for the last wave of parades. And they start early! The Zulu Social Aid & Pleasure Club parade starts at 8AM followed by the Rex, Elks and Crescent City parades rolling along the Uptown route. While in the Marigny/Bywater section of town, the Societe de Saint Anne is assembling to march into the Quarter. Parade goers often dress up in costume for Tuesday’s parades and especially for the St. Anne’s parade, it’s often hard to tell who is in the parade and who is watching. Terry and I usually dress up, but opted not to this year. With the weather being so nasty, I was happy to be in my foul weather gear and rain hat this year!! We skipped Zulu and Rex, and headed to St. Anne’s parade and had a great time. Even with the rain, energy levels were high and people were loving life. And for those of you who have browsed through this whole post, here are a couple of video clips that capture the day pretty well! 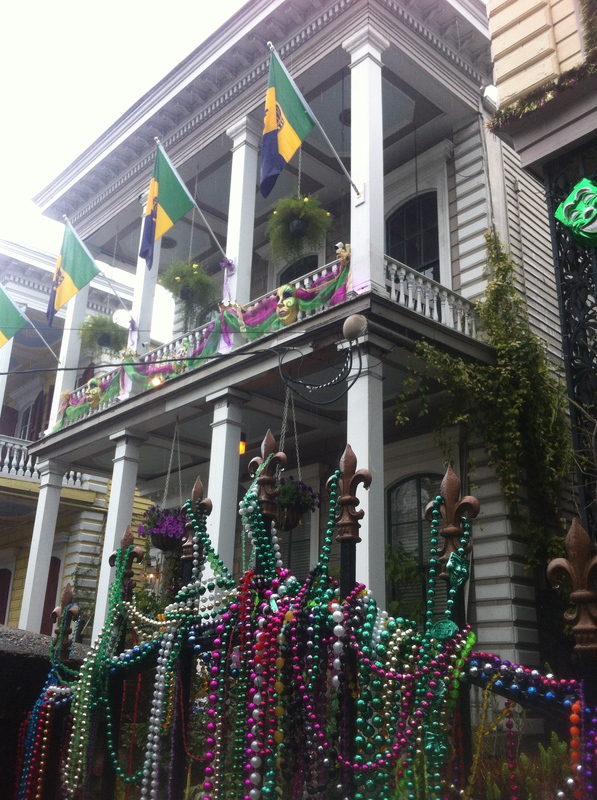 This entry was posted in Living Life Fully and tagged Beads, Mardi Gras 2014, Parades. Bookmark the permalink. I am so thrilled that your parents came down to enjoy the big weekend leading up to Fat Tuesday and now I know that weather did not scare y’all!!!!!! It really looked miserable on the news but I was thinking about all the great throws due to smaller crowds!!!! Bringing the World back to the Bayou? Loved it and this post!